Temporarily on hold as we refocus. Feel free to browse the archives for any day that interests you. Hula hoops were for kids. Coonskin caps were for kids. More recently, Cabbage Patch Kids were for kids. Tickle Me Elmo was for kids. As a kid, I wanted all sorts of fleeting, ephemeral things, some of which my parents got for me and most of which I don't remember. But it was my dad who wanted the CB radio. He already had a police scanner. He listened to it at night... he slept with it on all night... the better to keep up with what me and my idiot friends were up to, he told me. CB radios are the one fad I can think of from my childhood that was for the grown-ups, not the kids. My dad sent into the FCC for a license to use it. Later, no license was required. But, originally, there was a license issued, albeit without any particular exam or credential. 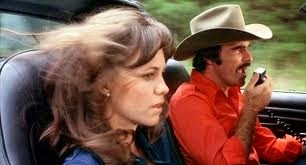 The CB craze swept the country in the mid to late 70s, spawning movies (Smokey and the Bandit, for example... Sally Field... sigh... oh, and Burt Reynolds and Jackie Gleason, too) and a top hit song ("Convoy" by C.W. McCall), and adding 10-codes into the popular vocabulary ("that's a big 10-4, there, good buddy"). It is that once-ubiquitous phrase, 10-4, that makes today, October 4, National CB Day. I never saw my father actually use the CB radio; I suppose he must have. He wasn't the sort to buy something and not use it. He did have it on, sometimes, when I was in the car with him. A local intersection that was always under construction was, I learned in this way, called "The Barrels." It took me awhile to figure out why. In the law, we call that an admission against interest. I have no idea if he had a "handle" when he was driving on his own. I can't imagine what it would have been. Send an email to this blog. Email is encouraged, but please note that any email sent to The Blog of Days may be published in whole or in part at the discretion of the blog proprietors. Happy Keister - Not the Easter eggs he wanted to find, but that’s life kid. Deal with it. Unknown The post Happy Keister appeared first on People Of Walmart. Ask Fresh Questions - Join us on Instagram. Today is German Unity Day. So far, it's worked out. Roll out the barrel -- it's National Polka Day!